Admissions 1. 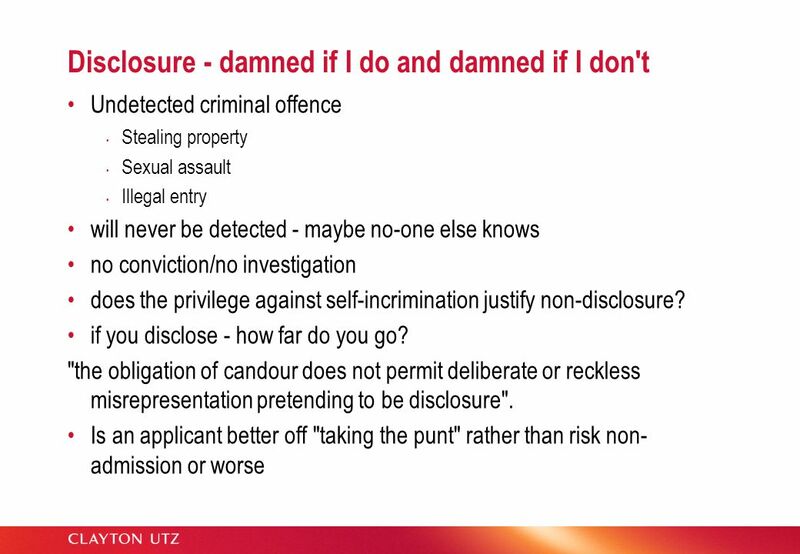 Duty of disclosure - where do you draw the line 2. 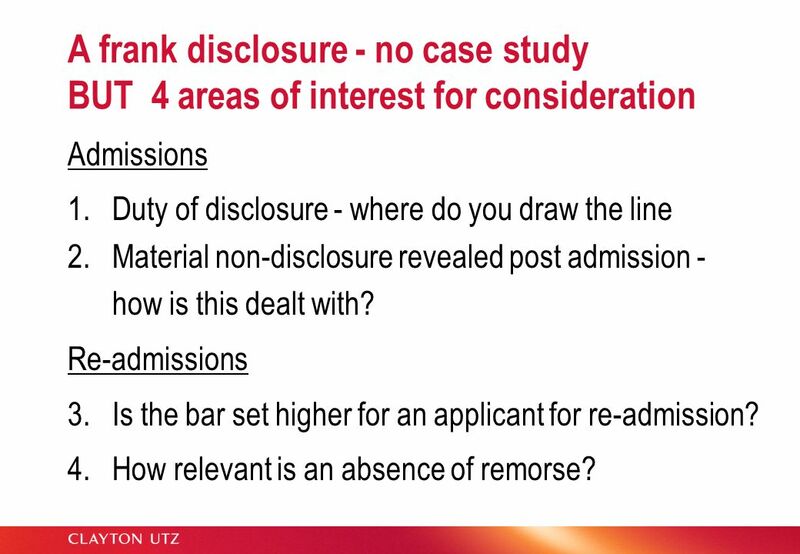 Material non-disclosure revealed post admission - how is this dealt with? Re-admissions 3. 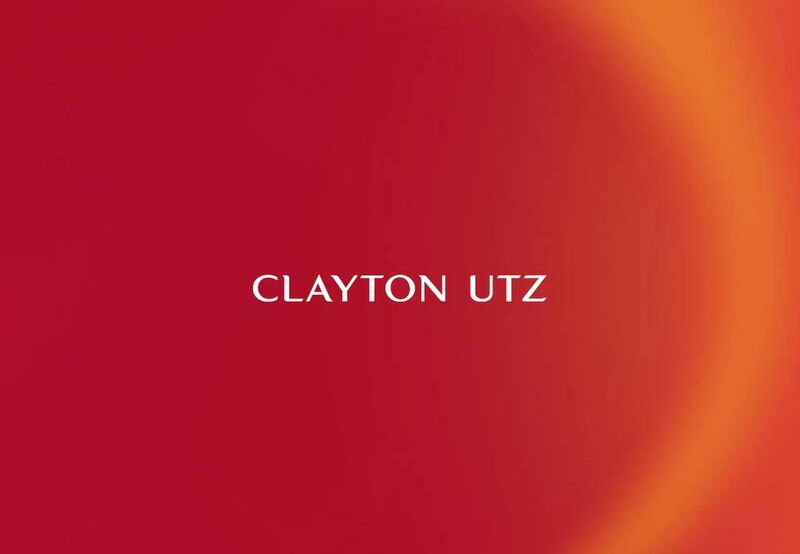 Is the bar set higher for an applicant for re-admission? 4. How relevant is an absence of remorse? 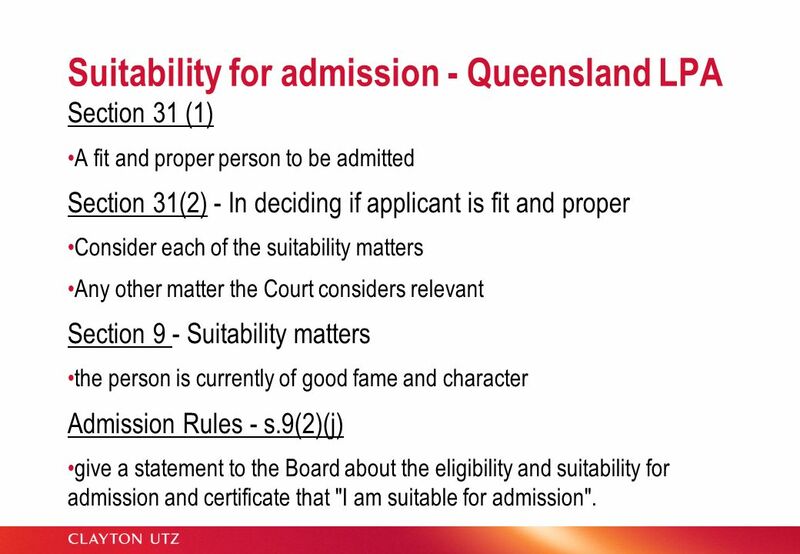 Section 31 (1) A fit and proper person to be admitted Section 31(2) - In deciding if applicant is fit and proper Consider each of the suitability matters Any other matter the Court considers relevant Section 9 - Suitability matters the person is currently of good fame and character Admission Rules - s.9(2)(j) give a statement to the Board about the eligibility and suitability for admission and certificate that "I am suitable for admission". 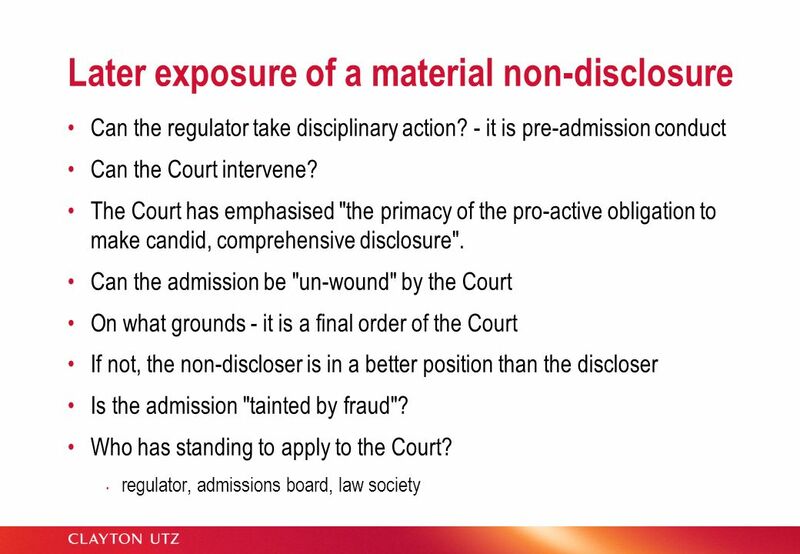 Is the obligation to disclose factors relevant to "fit and proper" and "good fame and character" set higher for applicants for (re) admission? 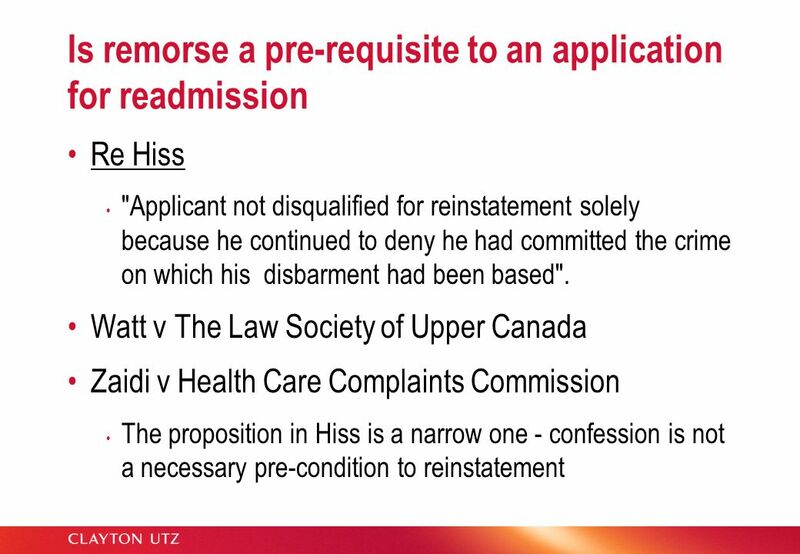 Applicants for (re) admission must displace the earlier judgment that they were permanently unfit to have their name on the Roll. 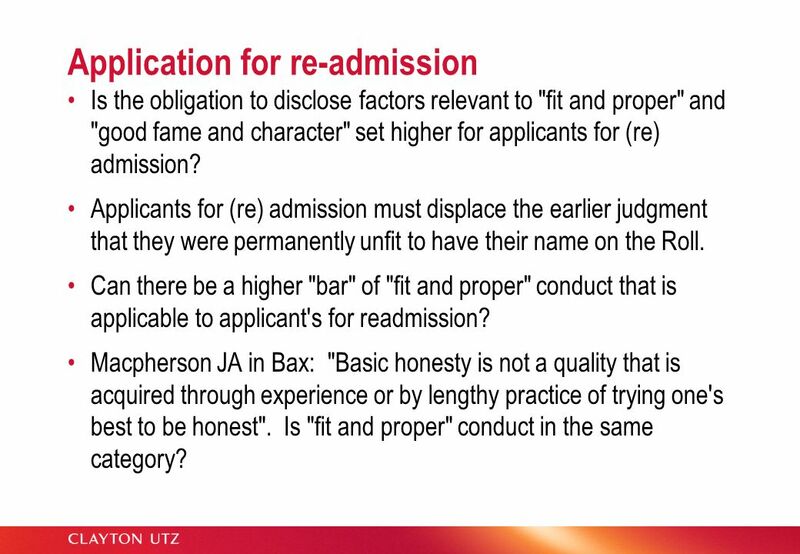 Can there be a higher "bar" of "fit and proper" conduct that is applicable to applicant's for readmission? Macpherson JA in Bax: "Basic honesty is not a quality that is acquired through experience or by lengthy practice of trying one's best to be honest". Is "fit and proper" conduct in the same category? 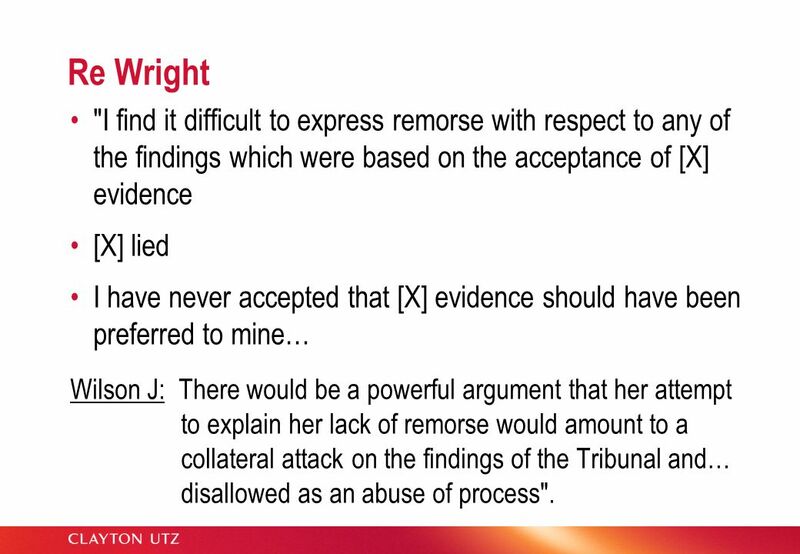 10 Re Wright "I find it difficult to express remorse with respect to any of the findings which were based on the acceptance of [X] evidence [X] lied I have never accepted that [X] evidence should have been preferred to mine… Wilson J: There would be a powerful argument that her attempt to explain her lack of remorse would amount to a collateral attack on the findings of the Tribunal and… disallowed as an abuse of process". 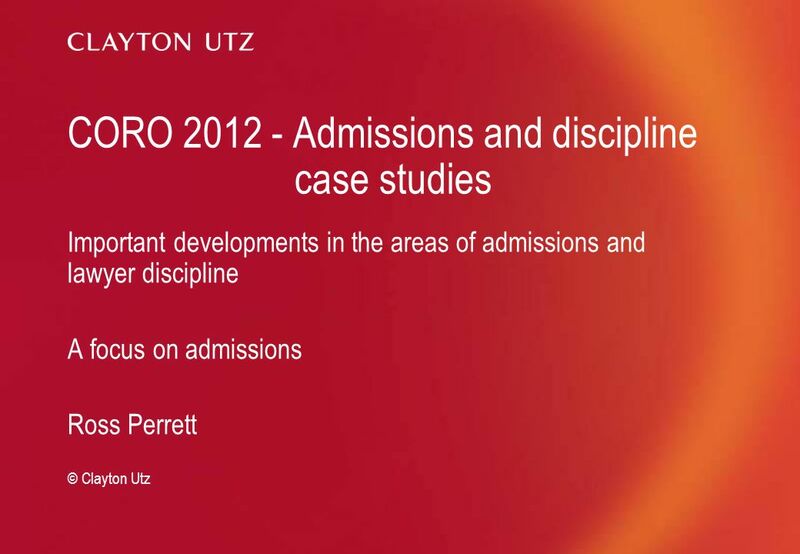 Download ppt "CORO Admissions and discipline case studies"
The New Safety Laws – Are you being Harassed? Jamie McPherson Partner MVM Legal. Ethics in Mediation Sandy Garrett, Chief Disciplinary Council, TBPR Richard Murrell, Moderator. GENERAL CHIROPRACTIC COUNCIL The UK’s Regulatory Body Dr Christina Cunliffe 1. Chapter 5 Computer Fraud Copyright © 2012 Pearson Education, Inc. publishing as Prentice Hall 5-1. 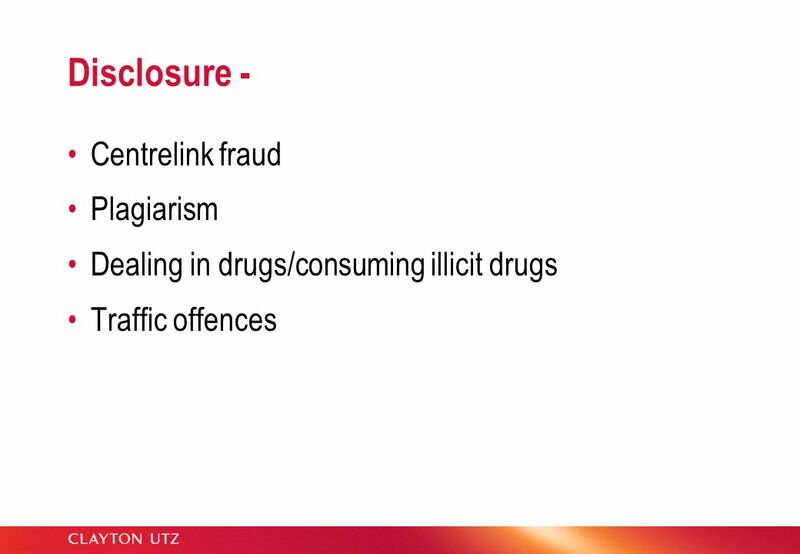 Chapter 5 Computer Fraud Copyright © 2012 Pearson Education 5-1. Radio and TV Journalism RTV 303 lecture 11 Mrs. Sarah Amin. By Nikki Barolsky and Ienash Rasheed BREAK AND ENTER OFFENCES. 1 CONSTITUTIONAL LAW 17 CRIMINAL LAW POWER: PROVINCIAL POWER TO PUNISH Shigenori Matsui. Character and credit Miiko Kumar 9 February 2015. 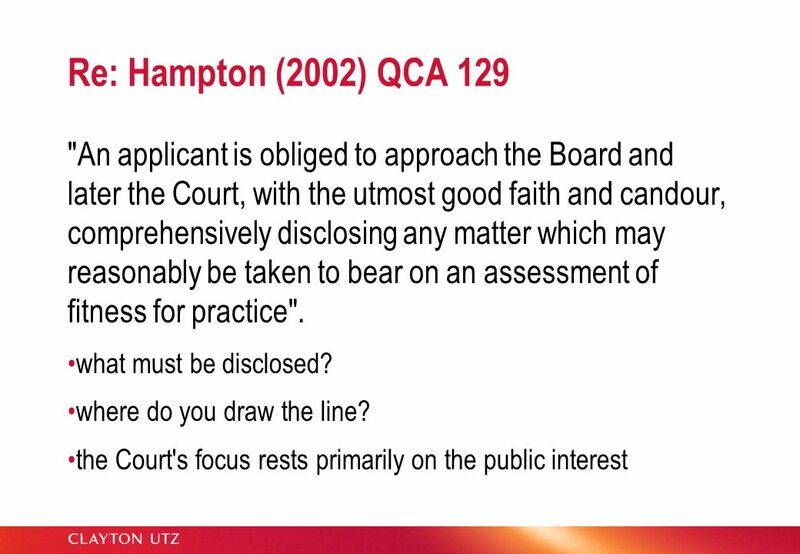 1 Fundamental Standards Antony Hall Care Debate 5 March 2015.